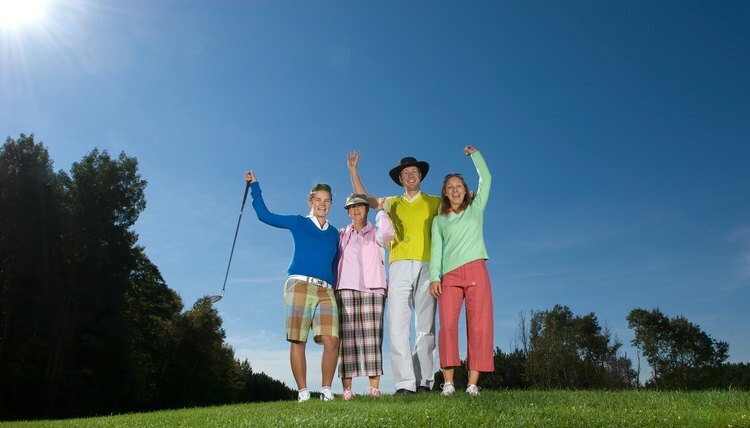 A golf scramble is a fun format for team tournaments or informal rounds among casual golfers. A golf scramble is a format for a golf tournament. Two or more players form a team, with the rules emphasizing fun without the pressure of players keeping individual scores. Each player hits a tee shot on each hole, but everyone plays from the spot of the best shot, subject to certain criteria. Rules for playing in a scramble are informal, with tournament organizers modifying basic rules as they wish. For example, organizers may require a group to select each player's tee shot at least twice. The scramble format is not covered under the official Rules of Golf. Instruct each member of your scramble team to tee off from your starting hole. In a scramble tournament, your team's opening hole could be any hole on an 18-hole course, depending on the assignment by tournament organizers. Players can tee off with the golf club of their choosing -- not necessarily a driver. Choose the best tee shot through a general consensus of your scramble team. The group can decide the best tee shot based on any criteria they choose. Usually the best shot is the longest drive that lands in the fairway. Or your team may choose a long tee shot that landed off the fairway in the rough if you have a decent lie. Mark the spot of the best tee shot with a golf tee or ball marker. Direct other players to pick up their balls and hit from within one club length of the marked spot. Continue selecting the best shot until one player hits the ball in the hole. The team score is total of the best shots.